We were hanging out in our back garden when all of a sudden we noticed that our dog had climbed the tree! 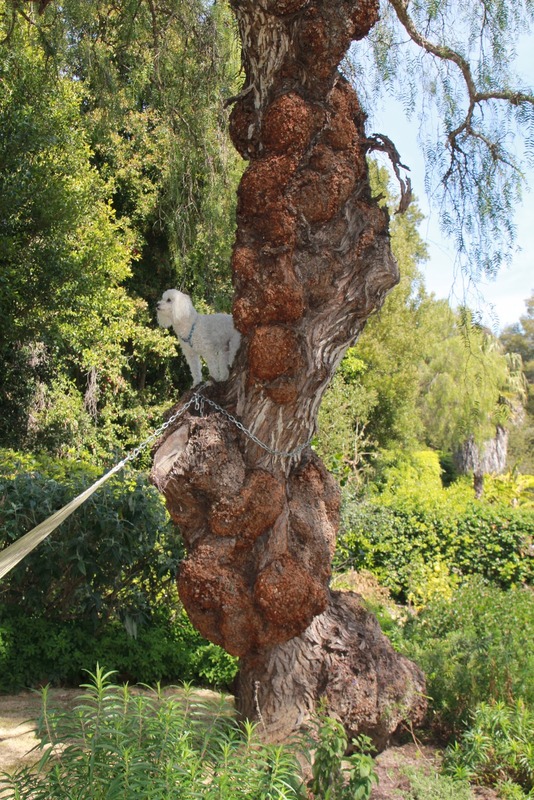 Who the heck has ever heard of a tree-climbing poodle?! Of course, once he was up there he couldn't climb down by himself so I had to climb part way up and get him down. Too funny! What a strange looking tree. What kind is it? Wow, who knew? Do you have a cat, too, and maybe he was mimicking? Wouldn't it be fun to know what he was thinking? That's an interesting tree, too. That's amazing - the tree as well as the dog! How high is that tree and how far did the poodle climb? Maybe he's part mountain goat!! I didn't even notice the puppy in the tree at first glance. I wonder how long he had been planning how he was going to be a part of Saturday Snapshots? Too funny. Lisa--This climb from a dog who likes to pretend he can't get up onto a bed by himself. Now we know better! Oh that's too funny. 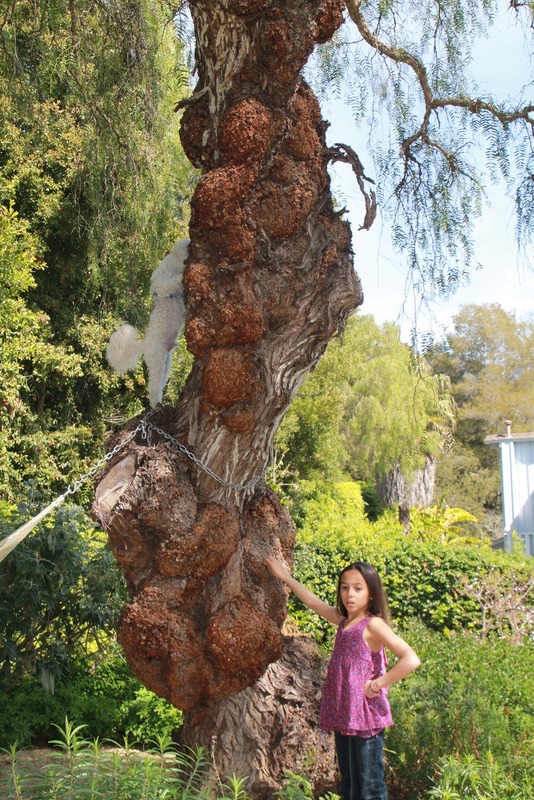 My family had a poodle for many years and he never tried to climb a tree. Chase rabbits and squirrels, yes, but trees, no. LOL!! What a funny little dog!! Animals sure have their own little individual personalities, don't they? Our cat Beneigt acts a lot like a dog...he will raise up and scratch on the door to go out, drink from the toilet if the door is open, and will even come when you call him (which is amazing for a cat) ;) We call him a "catdog." My Jack Russell loves climbing trees too! That's a very strange looking tree. Never saw one like that before! That's great, I couldn't imagine a poodle climbing a tree like that. I hope you got him down in one piece. At first I didn't even see him...I was too busy being fascinated by the odd-looking tree. The picture is just plain cool for the tree alone, but add a tree-climbing poodle and that makes for an awesome couple of pictures! Leslie--Squirrels are definitely our dogs main nemesis! Ellie--So glad to hear my dog is not alone in his tree-climbing pursuits! 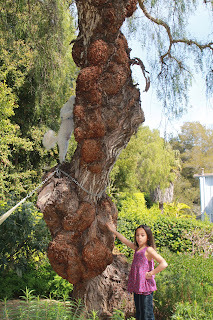 We love our bulbous tree! Peppermint--sorry! I accidentally skipped you. Thank goodness our dog doesn't drink from the toilet! That's so funny that you cat is doglike and my dog is catlike. Oh my gosh, I love that! What a powerful pooch! He sure must be a handful... and the tree itself looks very interesting. Kavyen--You know, it's funny, usually he is such a calm dog and not a trouble-maker at all. Alyce--Now it feels like a party trick. We're all waiting to see if he'll do it again! Those poodles sure are unpredictable. Great snapshot. Irene--Now I know why poodles are circus dogs!